La Bomba returns once again to Ministry of Sound on Saturday 28 December for a special Christmas Takeover party. 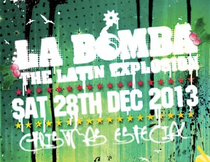 La Bomba – Christmas Especial - features an exclusive DJ set from Dutch dirty house DJ Vato Gonzales, backed up by Notting Hill Carnival’s The Heatwave, and some of Europe and the UK’s most exciting and influential Latino DJs: Alejandro De La Cruz from Germany and DJ Mega from Denmark. Also on the bill are the UK’s Latino DJs Jose Luis and El Moreno and full London DJ Crew pumping out the finest Latin house, reggaeton, moombah, trap, salsa and bachata. Vato Gonzales, signed to Levels Recordings/Ministry of Sound, reached no. 7 in the UK chart with ‘Badman Riddim (Jump)’ featuring Foreign Beggars and the follow-up single ‘Not A Saint’ featuring Lethal Bizzle & Donae’o went top 20. He’s remixed Major Lazer, Skepta, DJ Zinc, 2 Bears, Sway, Rizzle Kicks, Taio Cruz and has enjoyed a successful DJ career, helped by his ‘Dirty House’ mix tape series. La Bomba also welcomes The Heatwave to their DJ ranks, the UK’s bashment sound system who will be bringing the mash-up sound of dutty house and dancehall of their Hot Wuk party to the proceedings. As well as their Notting Hill Carnival stage they present shows on Rinse FM and 1Xtra and have been playing live worldwide for 10 years. They will be backed up by La Bomba DJ/promoter Jose Luis playing B2B with El Moreno, Alejandro De La Cruz (DR/Germany), Saul Maya and Ezekiel Uglyboy and MC Scooby will hold ceremonial duties.